End-to-end Print MIS and Workflow Automation software provider to showcase new product developments at Dscoop Phoenix. “We are always galvanized by the enthusiasm and energy at Dscoop"
SmartSoft will be demonstrating the latest enhancements to PressWise, the all-in-one web-to-print, MIS and Workflow Automation solution, at this week’s Dscoop “Imagine” exhibition in Phoenix, Arizona. The convention, which runs from March 1st – 4th, 2017 at the Phoenix Convention Center, is focused on building community in the print industry through interacting with peers, exchanging experiences, and learning best practices. The annual conference is one of the print industry’s most important gatherings, where members can build partnerships, alliances and relationships that impact their business for years to come. PressWise by SmartSoft, situated in Booth 201, will be demonstrating the results of an industrious year’s product development. PressWise is a print shop management system designed to help printers grow their business while eliminating touches from their workflow, through an end-to-end, cloud-based print MIS and production automation platform. -A major update to Purchase Order functions is being rolled out to better accommodate outsourcing. Users can now purchase non-inventory items, including services and finishing tasks. Outsourced Products POs can be automatically created upon order injection, PO line items associated to specific jobs, and POs emailed directly from within PressWise. There are additional PO updates that will be available for review at Dscoop. -Kitting functionality, introduced just after the last Dscoop, allows for jobs that contain multiple components that go together to form a single product within PressWise for simplified quoting and invoicing. -There are a number of key Impositioning enhancements, including support for Work & Tumble as a work mode on quotes. The system now includes full support for Grippers throughout the system for each press device, from quoting and ordering to batching and auto-impositioning. -Security is critical and sometimes it may seem complex to apply for, receive, and install/utilize SSL certificates for custom domains. PressWise has automated that process, allowing admins to obtain an SSL certificate from Let’s Encrypt™ with just a few clicks. This optional feature is free of charge. -Inventory/stock purchases can now have minimum stock order amounts by substrate with the additional option of specifying a quantity per carton. This allows you to capture those costs and pass them along (if desired) to customers without relying on staff to remember to make manual adjustments. -Single Sign On (SSO) options are now available, letting customers leverage their existing authentication infrastructure to control access. This is of particular value for In-plant print departments of larger organizations. -User Interface Enhancements offer in-line editing in many areas with enhanced grids to make viewing, searching, and filtering information easier than ever before. Recently added reports include a Customer Aging Report, Customer Statements, Customer Activity, and more. Joe Lehn, Director of Product Management for PressWise, will be attending Dscoop as an exhibitor with the team and as a panel presenter to discuss best practices when utilizing MIS systems. “We are always galvanized by the enthusiasm and energy at Dscoop. The vision of the organization and its membership is very clear and we always look forward to the show,” said Mr Lehn. “It is a great place to meet so many of our customers, who have been pioneers in the digital print space. Many of them were early adopters of PressWise, including multiple board members. 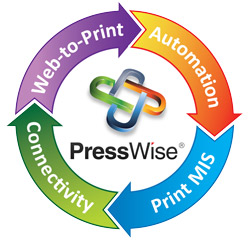 For more information on PressWise print MIS and workflow automation, visit http://www.presswise.com. PressWise is an end-to-end SaaS-based MIS and Print Workflow Automation solution that comes complete with robust features such as unlimited web storefronts, estimating, quoting, order processing, workflow management, complete shipping integration, fulfillment and the ability to integrate with most other third party storefronts (including PTI, Pressero, PrintNow, PixFizz, PageDNA, RedTie, Prisme and more) and existing back-end accounting systems. For more information, visit http://www.presswise.com.